I have some products to tell you guys about that I've been using for about two weeks now. All the products in today's review are from a company called Prestige Cosmetics, they are sold online and at stores like Ulta, Rite-Aid, Duane Reade, and Navarro’s. Prestige Cosmetics have been around for 30 years so they know a thing or two about making high-quality affordable makeup. If you've been following me for awhile now you probably know I'm turning into a bit of a lipstick fanatic so I'm really excited to tell you guys about these first two products. This first one is called Color Persist Long Wear Lipstick in Bold Rose and I am in love with this color. It's a blue based vivid pink and it's so flattering on me. I especially like this one because while it is highly pigmented it also has a moisturizer in the middle to help keep your lips soft while wearing. 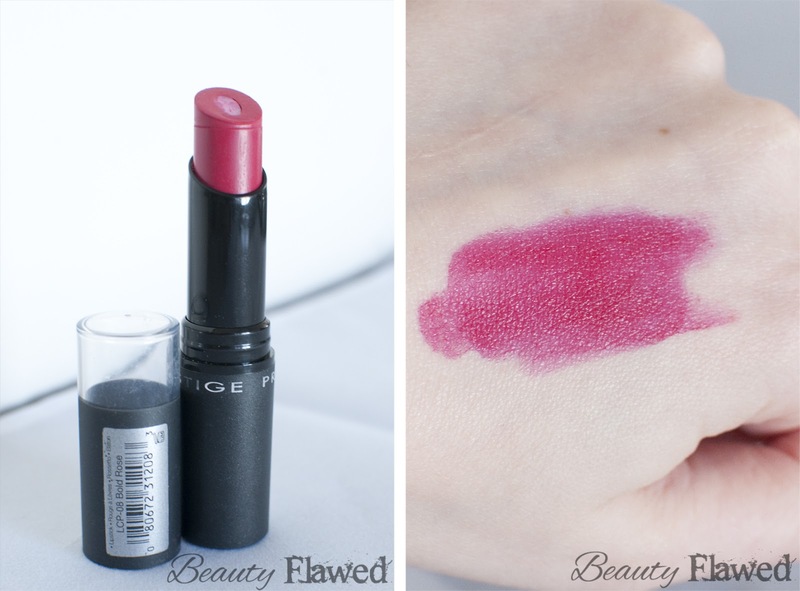 I have always liked lipstick that could do two jobs in one and this certainly does that. The packaging and design is also a plus on this product I like that the lipstick is rounded instead of pointed because it makes it easier to apply on the go without getting lipstick on the outsides of your lips. Wear time for this is also pretty good while it doesn't withstand eating or drinking it fades nicely and doesn't look patchy when your done you have a light flush of color left over. The second lipstick I have to tell you guys about is the Color Treat Anti-Aging Lipstick in Rich Ruby. I would say that this is a blue based red that is a bit on the lighter side. It leaves your lips feeling moisturized and with a good dose of color that stays on well except thru eating and drinking. 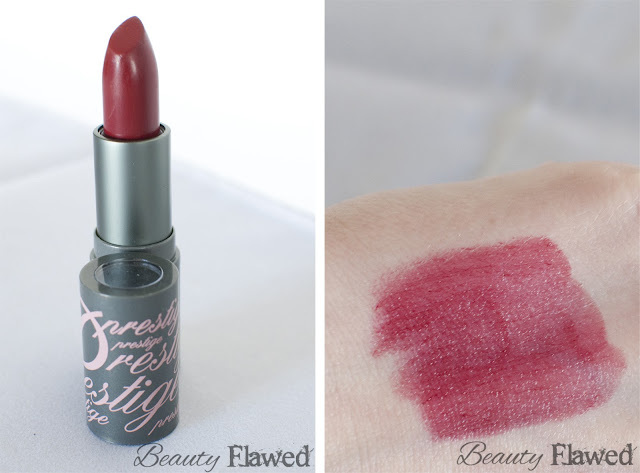 Like the other lipstick when this fades it leaves you with a nice flush of color that looks natural and not patchy. The packing on this is sleek and the shape makes it easy to use. Next we have the Brow Shaping Studio in Light Medium. I've been on the hunt for a nice brow product that would go along with my strangely not brown but not blonde hair. The packing is nice and sturdy and I like that it comes with a mirror. The powders both apply nicely, are pigmented, and I didn't have any trouble with the wear time. Also included is a small brush, tweezers and a brow stencil. The brush is helpful for on the go but I find it to be very stiff, I do like it's small size because I can easily use it when I don't have my glasses on (boo for being blind as a bat) without it banging into my mirror. The tweezers and brow stencil I didn't like as they both weren't very useful. Since the brow stencil had been folded I found it hard to use because it was hard to get it to flatten out. The tweezers took a few attempts to grab onto the smaller stray eyebrow hairs. That being said I do like the powders and the packaging on this product I think they could do without the stencil and tweezers. Onto the Waterproof Eyeliner in Payday this is a soft and creamy pencil and I was quite impressed by it's texture. I have quite a few eyeliners from drug store to high end and I feel like this one is a happy medium between the two quality's. This glides on nicely and once applied you have a bit of time to smudge it before it sets. I do wish that it was a bit more pigmented it's a bit faint if you don't go over it a few times. In the photo I went over the swatch 3 times. As for staying power it does stay on well I did have to touch it up once on my waterline but it wasn't noticeable it just wasn't as dark as I would have liked it so I re applied. Last up is the Beauty Bar Eyeshadow Palette in Surrey. This palette has really nice and sturdy packaging which I really like because I can easily throw this in my purse and not worry about it getting eye shadow all over my other makeup products.It also comes with a little sponge applicator that can be handy when your out and about. Now the pigmentation on this product is hit and miss. I found the the lightest shade doesn't show up well with or without primer. The other shades however do have some nice color to them especially when you add a primer. As you can see from the pictures above primer really makes all the difference, I swatched these over Eden Primer Potion by Urban Decay. I also wore these with Eden underneath and didn't have any creasing or fading issues. This pallet come in a few different colors and if your looking for something that that is affordable and has pigmentation (as long as your planing on using a primer) I would recommend checking this product out. You can find any of these products for purchase at Prestige Cosmetics website or in stores like Ulta, Rite-Aid, Duane Reade, and Navarro’s. These items are priced anywhere from $5.25 to $8.95 depending on which product your looking to get. I know for me personally I'll be picking up some more Color Persist Long Wear Lipstick from their line in the future! Have you ever tried Prestige Cosmetics? Disclosure: This review contains product(s) that were provided to me for consideration by the manufacturer or its PR firm. Complimentary products do not influence the honest opinion of the review, for more information refer to my Disclosure Policy. That long wear lipstick looks great! I love the long wear formulas but hate how dry most of them are. Might have to look for this next time I'm at ULTA! It is really nice I'm in love with the color and wear! Def going to check out this brand the next time I'm at my local Ulta. That lipstick looks really great! I love the color of it! I love this color! It really pops in a beautiful way. I think it will look great in the winter. i love the bright rich pink lipstick - so pretty! I haven't ever tried Prestige, but I've been on the hunt for a good long-wear lipstick for a while now, and I'm really liking these shades. Will have to give this one a try! Get bold rose you'll love it the color is amazing! I've never tried this brand before. Can't believe what a difference the primer makes! Ashley, thanks for swinging by my blog and saying "hi", and I'm glad to have found yours in return! These are great reviews ... I'm kind of a makeup junkie but actually haven't tried anything by Prestige yet. I definitely need to give it a try! Thank you, if you do I highly recommend bold rose! I have heard of this line and actually use their lip liners. Great product for a great price! I need to check out some of their other stuff too. Looks like you scored some fab finds! It really is an awesome color. Thank you so much glad you stopped by! Oh man I'm a lipstick fanatic too! I absolutely love those two colors and can't wait to try them out! Popping over from the GFC blog hop. Glad I'm not the only one! Let me know how you like them. These all look lovely, I have never tried Prestige!! They are good quality and an even better price I really recommend the lipsticks. Love the 2nd lip color and the eyeshadow palette is fabulous.